Vodka, a clear spirit distilled from grains, is known for having no distinctive flavor of its own. 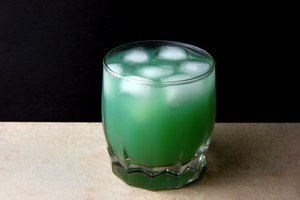 It's not sweet, sour or bitter, and it doesn't possess the character of any particular ingredient, but vodka does pack a powerful alcoholic punch that makes its presence unmistakable in any mixed drink. Vodka's neutral potency makes it very versatile – probably the most versatile of all spirits – so it's hard to name a mixer that doesn't go well with vodka. 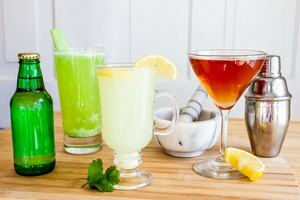 Browse a list of vodka-based mixed drinks and you'll see among them every category of cocktail, including tropical Tiki drinks, summery spritzers, sophisticated martinis and dessert-like after-dinner confections. With vodka plus a single mixer, whether it's just a splash or a tall glassful, you can prepare a fine adult beverage in a matter of seconds; add another element or two and you'll venture into custom cocktail territory – it's a fun place to be. Soda water and tonic water are classic mixers for vodka, and a great choice when you want something bright, crisp and low in calories. These essentially flavorless mixers are best with a quality vodka, and are enhanced by a squeeze of lemon or lime or a dash of cordial. Your favorite soda, whether it's cola, Dr. Pepper, lemon-lime soda or ginger ale, is almost certainly a good mixer for vodka, as are energy drinks if you enjoy them straight. Opt for diet versions if you prefer. Ginger beer, freshly squeezed lime juice and vodka make up a Moscow mule, which is traditionally served in a copper mug. Lemonade and iced tea, sweetened or unsweetened, work too. Combine the two for an adult Arnold Palmer, and consider other types of teas such as green, peppermint and ginger. Make a classic vodka sour by mixing a shot of vodka with a similar amount of freshly squeezed lemon or lime juice, or a combination of both, sweetened with a little simple syrup, sugar or honey. A splash of soda water cuts the potency of this strong drink, and you might also top up a tall glass with soda water for a bubbly, refreshing spritzer. Tart juices that are suitable in larger doses with vodka include grapefruit juice and cranberry juice. Vodka with cranberry juice alone is known as a Cape Cod. A cosmopolitan features vodka, orange liqueur, lime and cranberry juices, served in a chilled martini glass. Vodka with grapefruit juice is called a greyhound; salt the rim of your glass, and it's a salty dog. 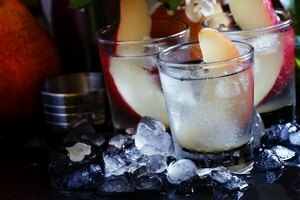 Any of the bottled fruit juices that you'll find at the supermarket, including juice cocktails and thicker juices labeled nectars, are likely good mixers for vodka. Orange juice and vodka are the only two ingredients in the iconic screwdriver cocktail, and with the addition of the Italian liqueur Galliano you have a Harvey Wallbanger. 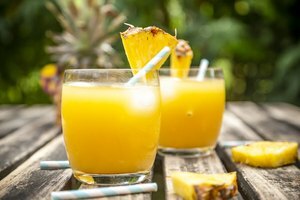 Try tropical juices like pineapple, mango and passion fruit, or make a refreshing, summery drink with melon and cucumber juices. If you have a juicer or access to fresh-pressed juices, you can easily prepare adult versions of any juice combinations you like, with nutritional benefits. One of the most famous mixed drinks of all, the bloody Mary, combines vodka with savory tomato juice and seasonings – typically salt and pepper, Worcestershire sauce and optionally hot sauce, along with a crunchy celery stick and all manner of creative garnishes. Make the same drink with Clamato juice (half tomato, half clam juice) and you have a bloody Caesar, the national drink of Canada. Tomato juice blends available in bottles and cans, such as V8, can also be used as mixers for vodka in the same way. Dairy, soy and nut milks, as well as heavier half-and-half and cream, can be used as mixers for vodka, usually with the addition of a liqueur that complements creamy flavors and textures. Coconut cream, regular and light coconut milk and coconut water are also good mixers for vodka, particularly in Tiki drinks. Try mixing vodka and cream or milk with a chocolate liqueur such as creme de cacao, a coffee liqueur like Kahlua, or an almond liqueur like amaretto. Some fruit flavors, including banana and strawberry, also work with creamy vodka cocktails. Or skip the third ingredient in cream- or milk-and-vodka drinks by using flavored vodkas, which come in countless varieties. Hot teas, coffee drinks and hot chocolate can all be augmented by a shot of vodka, although flavored vodkas tend to be a better fit for these mixers. With hot chocolate, try a mint, coconut or perhaps a chili vodka. Cinnamon and vanilla vodkas are fitting for coffee drinks. There are countless different tea and flavored vodka combinations. Try lemon vodka in a cup of ginger, green or chamomile tea, vanilla with Earl Grey or chocolate vodka with peppermint tea.